Could this be the weirdest thing ever dumped in a back garden? 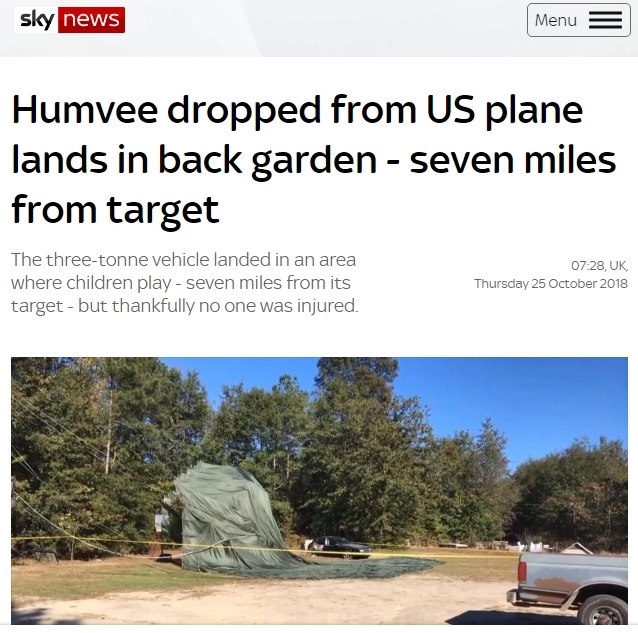 This story from Sky News caught Steve’s eye this week as he’s always getting odd stuff in his back yard, either blown in by the wind or dragged in by the local cats! But this has to be a contender for the weirdest ever – a 3 Ton 4 x 4 vehicle which was accidentally parachuted in by the military! So, that got Steve thinking , what is the weirdest thing you’ve found in your back-garden? Perhaps you have some unusual animal visitors or maybe had something delivered by mistake? Let us know via our Facebook and Twitter pages or emailing steve@accessradio.biz. You can read about all these stories on the Sky website by clicking here or on the story image below.